The new Fitbit Ultra Wireless Activity Tracker makes every step you take a step toward better fitness, even on your busiest days. Like the original, the Ultra tracks your day down to details a pedometer can’t catch, giving you access to the exact steps you take, calories you burn and distance you travel, along with how long and how well you sleep. And now, with its altimeter technology, Fitbit can track the heart-healthy activity of climbing stairs, encouraging you to take the stairs not the elevator, or walking that hill. The Ultra also gives you more measures to track your fitness (a stair counter, a stopwatch, and fitness achievement badges), and more options (a clock, an iphone app, and new colors). 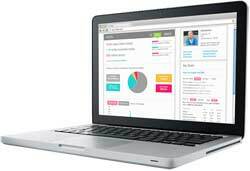 Check your real time stats at any time with a quick glance at your tracker. It’s compact and discreet enough to wear all day long in your pocket, clipped to your waist, or even attached to your bra. Good sleep is another key to good health and weight loss, which is why Fitbit can also track your sleep. Simply slip your tracker inside the included wristband and you’ll see how long and how well you sleep. Fitbit wirelessly uploads your data to Fitbit.com whenever you’re within 15 feet of your computer. Works automatically -- no buttons to push, no data to enter. 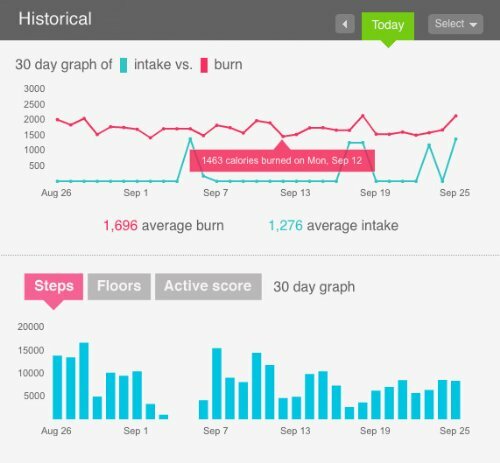 At Fitbit.com, free online tools show how your activity measures up over time and keep you motivated, with no monthly fee required. Track your progress with graphs, see how you compare to others, or compete with friends and family. 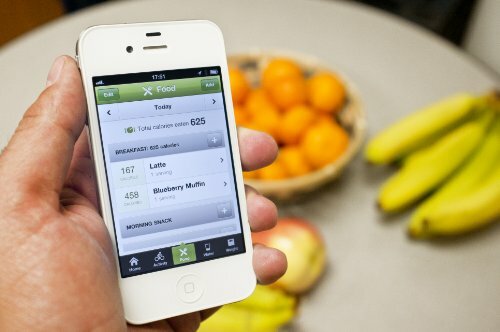 Plus, you can use Fitbit.com or Fitbit’s new free iphone app to log what you eat from our database of over a 100,000 foods, or record workouts from activities like pilates, yoga, or cycling. The Fitbit ultra gives you a clear sense of how you’re doing and encourages you to be more active, because the more you know, the more motivated you’ll be. 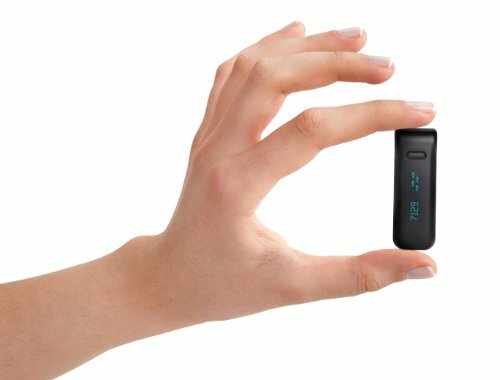 And these small changes can really add up: Fitbit users increase their daily steps by 43% and have lost an average of 13 lbs. The new Fitbit Ultra Wireless Activity Tracker makes every step you take a step toward better fitness, even on your busiest days. The Fitbit Ultra monitors your all-day activity to provide you with real-time feedback on steps, distance, calories burned, and stairs climbed to encourage you to walk more and be more active. It wirelessly uploads your data to Fitbit.com so you can gain deeper insight into your daily or monthly fitness and sleep levels with free online graphs and charts. On Fitbit.com, you can earn fitness badges, connect with friends to share and compete on fitness goals, or join the Fitbit community for advice and encouragement. Log food and workouts online and with iPhone app. 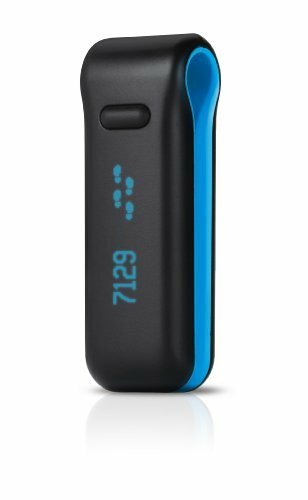 Thanks to its compact design, this tracker can be easily tucked into a pocket or bra, or used with the included wristband. 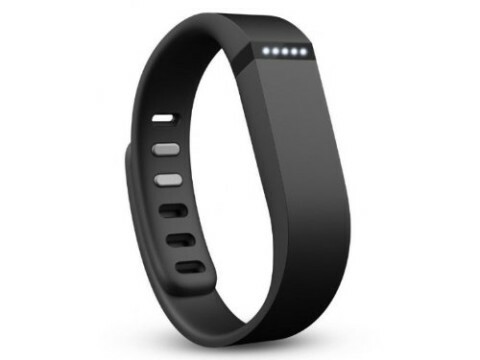 The Fitbit Ultra shows you how many steps you've taken, number of stairs climbed, and calories burned. 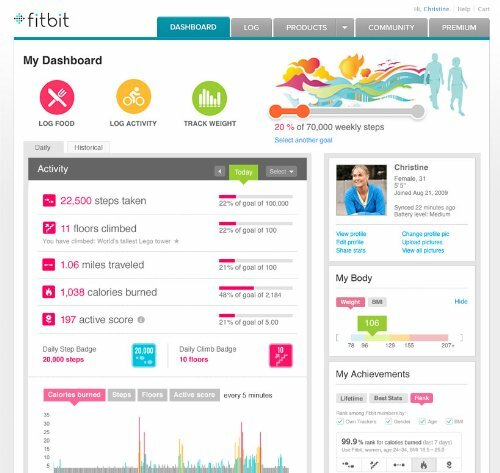 Log onto Fitbit.com to keep track of your progress, workout goals, or create a fitness network. View larger. 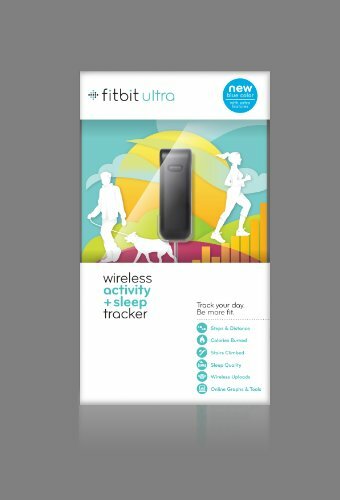 Using a 3-D motion sensor, Fitbit Ultra tracks all the details about your daily activity that conventional pedometers would miss. 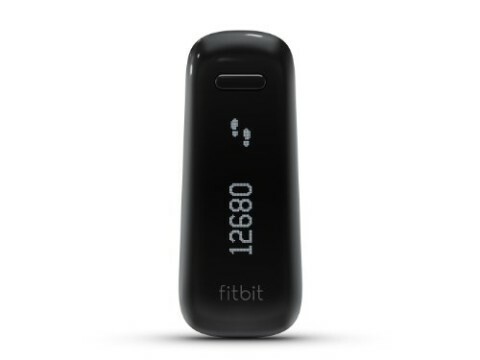 When worn close to the body, this device tracks daily steps, number of stairs climbed, distance traveled, calories burned, and overall intensity of the activity level. 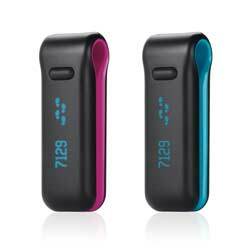 Fitbit Ultra also contains an altimeter to track stairs or hills climbed. 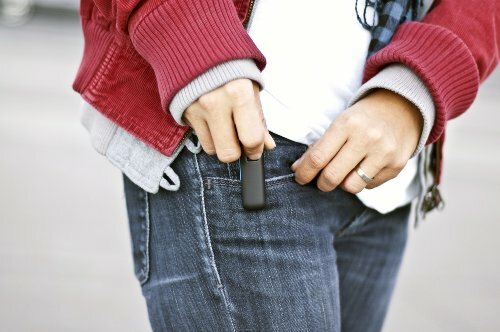 The compact design of the Tracker makes it easy to wear tucked into your pocket, clipped to a belt or bra all day. 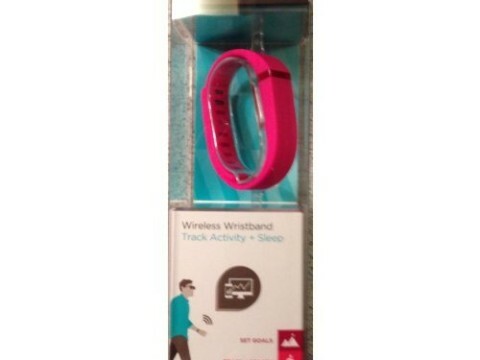 You can also wear the Tracker at night with the included Fitbit wristband to monitor how long and how well you sleep. Fitbit Ultra will monitor when you fall asleep and how many times you woke up throughout the night to provide a sleep efficiency index. To help you gauge your progress, Fitbit Ultra wirelessly uploads your fitness data to Fitbit.com automatically whenever you're within 15 feet of your computer--no need to take time out of your busy day to enter stats. At Fitbit.com, you'll enjoy free online tools that show how your activity measures up over time and keep you motivated, with no monthly fee required. Your dashboard quickly shows you how close you are to achieving your weekly goals on calories burned, steps taken, and other fitness goals. 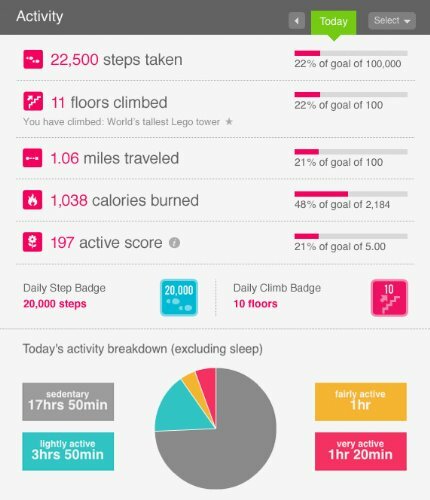 Fitbit makes fitness fun by translating your real accomplishments into real life examples. For instance, tracking that you've climbed 22 floors is the same as climbing to the top of the Statue of Liberty. To keep you motivated, you can earn badges for daily and lifetime fitness activities. Invite friends through email or through Facebook to connect on Fitbit.com to build a fitness network. Set collaborative or competitive challenges together, or tap into the growing Fitbit.com community to access tips and receive encouragement. 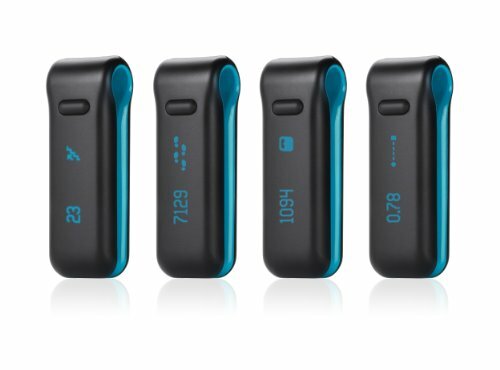 With Fitbit, it's like working out with a group of virtual friends every day. You can build a complete picture of your overall fitness by logging foods and workouts. The Fitbit database has over a 100,000 specific food items for you to select from. Enter workout specifics from yoga, Pilates, elliptical workouts, boot camp, spinning, kickboxing, and even Wii games from the workout database. Fitbit's Food Goal feature shows you the range of calories you should stick to every day to reach your weight loss goals, and dynamically adjusts based on your day's activities. 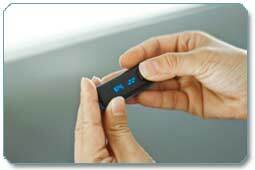 You can also track your weight and other health indicators like blood pressure, glucose, and heart rate. Much more than a pedometer. 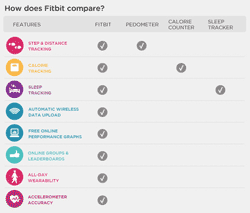 Click to see how the Fitbit compares to other fitness-tracking devices. With our mobile website and our free iPhone App, you'll be able to log workouts, food, water, weight, and much more, plus check your stats while on the go. Log workouts and food even when offline, so no detail gets forgotten. 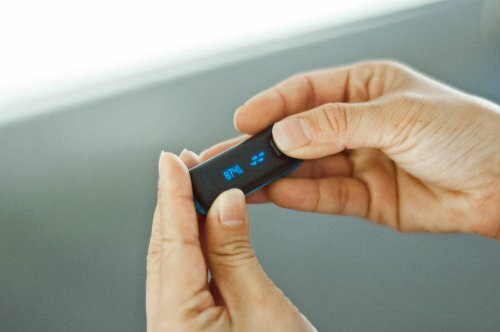 Fitbit can also integrate with many nutrition and fitness apps to make it easy to sync your stats with programs such as LoseIt!, RunKeeper, and Microsoft HealthVault. The Fitbit Ultra Wireless Activity Tracker is backed by a manufacturer's limited one-year parts and labor warranty. 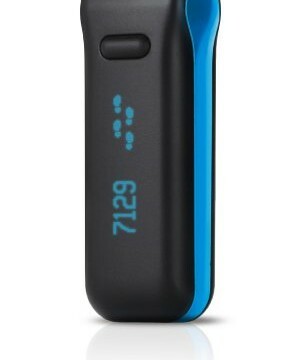 Fitbit Ultra Tracker (Black/Blue), sleep wristband, belt holster, and base station with charger. *This information was taken from a large-scale fitness study conducted by ThreeDefined in January 2011.
please check local laws before purchasing. No warranties made on product. sell as is.